Lunasin has been getting a lot of press, research and attention for benefiting a variety of health conditions. It is important to understand the science behind Lunasin, and how it can help your body. Lunasin is natural, and found in soy, barley, and rye. It is a 43-amino acid polypeptide with poly (L-aspartic acid) sequence at the carboxyl terminus. Proteins and peptides are fundamental components of cells that carry out important biological functions. Proteins give cells their shape, for example, and they respond to signals transmitted from the extracellular environment. Certain types of peptides play key roles in regulating the activities of other molecules. Structurally, proteins and peptides are very similar, being made up of chains of amino acids that are held together by peptide bonds (also called amide bonds). So, what distinguishes a peptide from a protein? Lunasin is a “bioactive” peptide which means it is a compound that influences living things and their core elements – like tissue and cells. Bioactive compounds have been shown via research and studies to have an influence on health. Areas of Lunasin research have focused on cancer, cholesterol, cardiovascular, inflammation, skin health and anti-aging. Let’s examine these studies and how the science supports the benefits of Lunasin on your health and well-being. Studies in animals suggest that soy can prevent or reduce bone loss. In laboratory studies, iso- flavones slowed down the growth of several different types of cancer cells, including breast and prostate cancers. Animal studies showed that genistein, one of the isoflavones, may interfere with tamoxifen that is used for breast cancer. But a new study showed that soy foods can benefit women with breast cancer. Patients should consult their physicians about use of soy supplements. Soy protein has an approved FDA health claim for reducing LDL cholesterol and CVD risk but the active component and mechanism of action are unknown. They tested the hypothesis that the lunasin peptide is the active component in soy protein responsible for lowering LDL cholesterol. Using a lunasin bioactivity assay, we were able to produce a lunasin-enriched soy extract (LSE) containing 100-200-fold more bioactive lunasin than soy protein isolates. To test the in vivo efficacy of LSE, we conducted a food supplementation experiment on five pigs that have high LDL cholesterol due to mutations in their LDL receptor genes. The pigs were fed casein-based diets and after two weeks their casein diet was supplemented with 250 mg LSE every day for eight weeks. Blood draws and lipid panel testing were done at -2w (before casein diet), 0w (2 weeks casein), 4w (4w casein + 250 mg LES) and 8w (8w casein + 250 mg LES). Results showed that casein diet increased LDL cholesterol levels in the LDL-R mutant pigs by an average of 6.7%. The addition of 250 mg of LES in case in diet reduced LDL cholesterol by 8.6% and 6.4% after 4 and 8 weeks of treatment, respectively. These results prove that lunasin is the active nutrient in soy protein responsible for LDL cholesterol lowering and its mechanism of action is by reducing cholesterol biosynthesis in the liver. Inflammation has an impact on all areas of health and well-being. Inflammation is part of the host defense mechanism against harmful matters and injury; however, aberrant inflammation is associated to the development of chronic diseases such as cancer. Lunasin is a novel peptide that demonstrates potential anticancer activity against mammalian cancer cell lines and may play a role in inflammation. In conclusion, lunasin and lunasin-like peptides purified from defatted soybean flour inhibited inflammation in LPS-induced. Although inflammation is linked in the public mind with chronic health problems such as heart disease, diabetes, and rheumatoid arthritis, de Mejia said it also plays a role in the development of cancer. “We know that chronic inflammation is associated with an increased risk of malignancies, that it’s a critical factor in tumor progression,” she said. “And we can see that daily consumption of lunasin-rich soy protein may help to reduce chronic inflammation. A study in 2017 examined the relationship between inflammation and obesity. The study was called “Lunasin attenuates obesity-related inflammation in RAW264.7 cells and 3T3-L1 adipocytes by inhibiting inflammatory cytokine production”. This study indicated that lunasin is not only effective against inflammatory response of RAW264.7 macrophages, but also highlights this suppressive property on 3T3-L1 adipocytes, and disrupts the crosstalk between macrophages and adipocytes, particularly by inhibiting secretion of pro-inflammatory mediators, might benefit to ameliorate obesity-induced inflammatory diseases. Lunasin has been shown to help with anti-aging. Epigenetics shows the relationship of Lunasin to aging. Epigenetics is the study of long-term changes in chromosomes that don’t involve alterations in the genetic code. But perhaps the most exciting area of aging epigenetics is the recent notion of an epigenetic clock, called Horvath’s clock, after its discoverer. The gist of it is that there is a strong association between the amount of genome-wide methylation and mortality. A lot of the genome is methylated when we are young but methylation is reduced in a constant clock-like way as we age. Methylation, recall, tends to silence genes. With age, it appears, an increasing number of genes that should be silenced are not, rendering us more susceptible to all manner of ailments. From reading the amount of methylation in the epigenome, scientists can predict an individual’s age with impressive accuracy. Results from a recent study conducted by researchers at the University of Pennsylvania show that yeast could help advance our progress in extending life in human cells. The team of researchers included Shelley Berger, PhD, professor in Cell & Developmental Biology and Biology & Genetics departments at the Perelman School of Medicine, Weiwei Dang, PhD, assistant professor at Baylor College of Medicine and former postdoc fellow at Penn, and Payel Sen, PhD, a current postdoc fellow in Berger’s lab. The study was published in Genes & Development and focused on how a certain epigenetic histone modification could extend yeast’s lifespan. “Researchers have just started to appreciate how these epigenetic histone modifications may be playing essential roles in determining lifespan,” said Berger. She has conducted studies on epigenetic marks for more than 20 years and was one of the first to identify histone modifications that are altered during aging and directly impact longevity. Dang explained that their study pinpointed a type of abnormal transcription that is significantly increased in older cells and, if reduced, can lengthen lifespan in yeast. He started the research when he was working in Berger’s lab. Although measuring aging in yeast is quite different from measuring human aging, Sen noted that using a budding yeast single-cell organism model turned out to be surprisingly powerful in their study of aging and epigenetic regulation. The research, science and benefits of Lunasin are clearly seen in these and many other scientific studies. 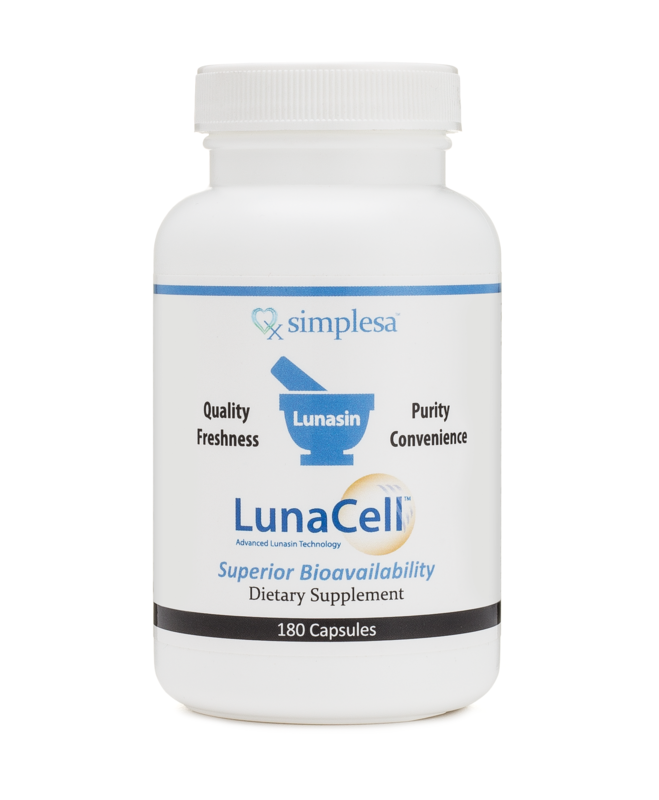 Simplesa LunaCell™ is the most advanced Lunasin supplement on the market today. LunaCell™ has more than twice the concentration of bioavailable Lunasin than any other product available. If you understand the science, then the choice is clear – choose LunaCell™!! The Benefits of Moderate-Intensity Exercise now Easier to Achieve than Ever for Patients with ALS (PALS)! The Nutritional Supplement approach to ALS! Simplesa® will be exhibiting at the 30th Anniversary Conference for The American Association of Naturopathic Physicians.